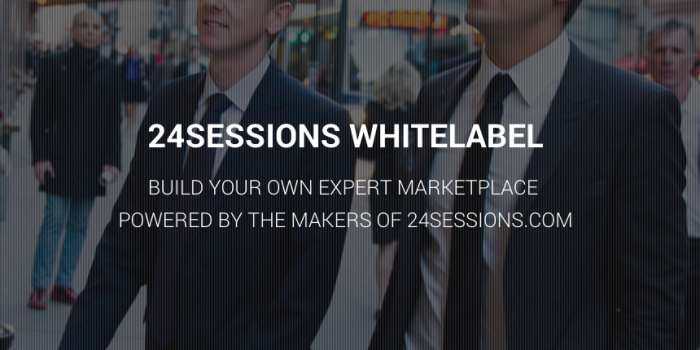 Since we launched 24sessions.com we wondered how our technology could be applied to other markets. Brainstorming how stuff like ‘school tutoring’ or ‘legal advice’ can benefit from the simplicity of our video-chat advice marketplace. And we were not alone! Startups and enterprises from all over the world asked: can we use the 24sessions technology to launch our own niche platform? From consulting firms to language training startups, they all had something in mind. So now without any hesitation we can say: YES YOU CAN! Today we officially present 24sessions white Label. Launch a marketplace for help via video-chat on your domain, with your styling and users, but built on 24sessions technology. We’re currently getting ready to launch the first two white label sites. If you are interested as well please contact us or read more about it on the special white label information website.